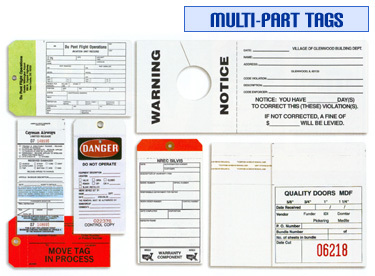 Multi-Part Tags, also called Manifold Tags or Snap-A-Part Tags, are available from two parts to five parts. All parts may be the same or each part may have different copy. CB (Back image transfer) usually the first part on a Multi-Part Tag. CFB (Front and back image transfer) usually the middle parts in a Multi-Part Tag. CF (Front image transfer) usually the last part of a Multi-Part Tag. Carbon Interleaved Multi-Part Tags are useful when the best image transfer is necessary. String or wire attachments with reinforcements are an excellent option for heavy use situations! For special attachment needs, consider pressure sensitive tape or adhesive stock. Self-lamination is a feature of Multi-Part Tags. A piece of clear polyester is attached to the tag as an additional part. The backing can be removed at any time providing for the preservation of information on another part of the tag.